Amd r9 nano from third party seller on amazon. Hopefully it will help somebody. Please forgive me my mistakes (and advise how to do better) as this is my first deal. 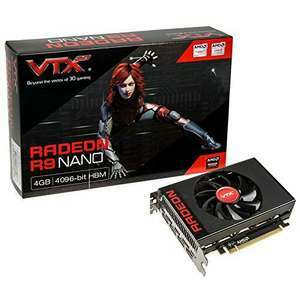 The AMD Radeon R9 Nano is a compact high-end desktop graphics card aimed at small form factor PCs (e.g. Nano-ITX). It is based on the same Fiji chip as the Radeon R9 Fury and Fury X and features 4096 shaders like the Fury X. The clock rate is slightly slower than the Fury X (1.000 versus 1.050 MHz) but in games the real world clock speed is slower due to the aggressive power limit). The chips is manufactured in 28 nm at TSMC and features the third generation of the GCN architecture (also known as GCN 1.2). Another similarity is the 4 GB of HBM graphics memory that is also clocked at 500 MHz (4,096 bit = 512 GB/s). The gaming performance of the R9 Fury is slightly above a GeForce GTX 980 (desktop and notebook) at maximum details and in high resolution settings (and clearly in 4K). The Radeon R9 Fury with less shaders but higher clock speeds (in games) however can pull slightly ahead on average (not in all games). All in all, the performance is sufficient for Full HD gaming with maximum details and anti-aliasing and in most games of 2015 also for 4K and high details. The Fiji chip fully supports DirectX 12 (feature level 12_0) in hardware and also integrates a new Unified Video Decoder (UVD). Like the Carrizo APUs, the R9 Fury is able to decode H.265 UHD videos on the chip. However, the HDMI outputs still only support HDMI 1.4 and therefore 4K at 30 Hz. HDMI 2.0 and HDCP 2.2, like the GeForce GTX 960, are not supported. The power consumption is a strong point of the Fury Nano thanks to the aggressive power target. It is rated at 175 Watt (compared to the 275 Watt of the similar fast Fury) and on average comparable with a GTX 980. Only the newer GTX 1060 and 1070 of the Pascal generation in 16nm can pull clearly ahead in terms of efficiency. The Nano market is very small, and the original price quoted is for the height of the bit-mining bubble; I would expect this to keep falling, especially as for less money you can get a RX series, water cool it and get better results. TBH, very few people would try and run a gaming rig in such a small case that they need such a tiny version of a top end AMD card, these were all about bit-mining. To be fair to this card though, it doesnt give much away to the monster R9 versions that are 3 times the length. Could somebody help me out please. I m after graphic card for christmas and I was going to buy this one. I ve got phenom 965 overclocked to 3.95ghz so probably that will be a bottleneck. I m gaming on lg 29 inch ultrawide monitor 2560x1980. At the moment I have gtx 750ti overclocked to max. My budget is 250£. I was thinking about gtx 1060 3gb as cheapest option but I m not sure. Please help thank you in advance. Could somebody help me out please. I m after graphic card for christmas …Could somebody help me out please. I m after graphic card for christmas and I was going to buy this one. I ve got phenom 965 overclocked to 3.95ghz so probably that will be a bottleneck. I m gaming on lg 29 inch ultrawide monitor 2560x1980. At the moment I have gtx 750ti overclocked to max. My budget is 250£. I was thinking about gtx 1060 3gb as cheapest option but I m not sure. Please help thank you in advance. R9 Nano is arguably more powerful but it's also older and will draw more watts from the wall. On the paper the R9 is miles better. In practice it is slightly better (varying from being equal to much faster). R9 Nano is arguably more powerful but it's also older and will draw more …R9 Nano is arguably more powerful but it's also older and will draw more watts from the wall. On the paper the R9 is miles better. In practice it is slightly better (varying from being equal to much faster). I will go for GTX 1060 6GB instead of this one. I have seen good deals with 1060 below £300. I will go for GTX 1060 6GB instead of this one. I have seen good deals …I will go for GTX 1060 6GB instead of this one. I have seen good deals with 1060 below £300. I m thinking about new build but parts are so expensive now so I m focusing on gpu for now. Thanks for advice. R9 nano will give me option for freesync and are low power hungry if only drop in price little bit more. I will wait 2 more weeks so hopefully sellers will start to fight for customer before christmass. Will see. What I would actually do in your situation is to sell your CPU/Motherboard/RAM/750ti which together with your £250 should give you at least a £325-350 budget. You could get a Ryzen 1200 plus motherboard, 8Gb DDR4 and an RX 560 for about that money which would be a much more balanced system and give you a better gaming experience than a Phenom plus 1060 or 580. Upgrade potential would be excellent too. I m thinking about new build but parts are so expensive now so I m …I m thinking about new build but parts are so expensive now so I m focusing on gpu for now. Thanks for advice. R9 nano will give me option for freesync and are low power hungry if only drop in price little bit more. I will wait 2 more weeks so hopefully sellers will start to fight for customer before christmass. Will see. At least get something with a DP /hdmi 2 port that can do 4k @ 60 Hz so you can use higher resolution on your desktop /movies /YouTube. You will not be doing any 2k/4k gaming on your budget but content consumption should be fine. Cold, £279.99 is a lot of dosh for a previous gen card that is around GTX 1060 performance. You'd be much better off getting a 6GB ITX 1060 from Nvidia. I owned one for a few months which I bought 2nd hand for £180 and wouldn't recommend to anyone now we have a better selection of ITX cards on the market. The coil whine was unbearable during gaming, like I could hear it despite wearing closed back headphones. Thought it was a bad sample but the issue is quite common on these cards. Good performance and size but we're not in 2015 any more. Not a good card anymore. For £100 less you can get a 570 itx which will offer near enough the same performance on a newer generation. The problem with the guy with the Phenom is that AMD's DX11 CPU overhead is tons higher than Nvidia's. It's hard to recommend AMD for systems with older/lower power CPUs if high frame-rates are your objective. Wouldn't recommend a Nano - 1060 is your sweetspot, RX 580 just as good if not better if you have a fast, modern CPU. As pointed out, the CPU usage of AMD cards is higher, since you have an older CPU, the 1060 6gb would be a much better option as it would limit your bottleneck the most. I think it should be pointed out that gaming isn't the only use of these cards, and this card has vastly better specs (tflops, bandwidth) than 580s at the same price, and with the same tdp.